It all started in the early 90s. Jon was living in Luton and working in North London, I was based in Solihull. We were fed up. On one of my infrequent visits to see him he passed me half a dozen sheets of badly-typed A4 about an incompetent detective called Hymie Goldman, whose life was a heap of garbage. It struck a chord and made me laugh out loud. I suggested we wrote a novel together about the character, taking it in turns to write the next instalment. We did. At first there wasn’t a plot, it was just a rambling series of episodes, in which we each tried to outdo the other in terms of gags, dialogue, characters and action. The characters seemed to develop lives of their own. By the time we had written the first hundred pages it had become a novel in search of a plot. At this point I hacked it apart and spot-welded the best stuff together to see where it might lead poor old Hymie. Jon was still writing whatever he felt like, but I at least had an idea where the plot was heading. The first complete draft was finished in 1993. It was something of a car crash – full of incident and pathos but reminiscent of a life tragically cut short. We added more gags then sent it to Hamish Hamilton, who said it “had potential but wasn’t really for them”, which we interpreted as “get lost, you’re rubbish” then gave it up as a bad job and filed it down the back of a radiator. Eons passed. Following redundancy in 2007 I rediscovered the manuscript while re-decorating the house, re-wrote it, and sent it to The Literary Consultancy for appraisal. They enthused about it but suggested re-writes, so I re-wrote it over again. Finally it’s finished, in all its anarchic glory. Hymie Goldman deserves a medal for surviving the hell we put him through, but he’s a survivor. 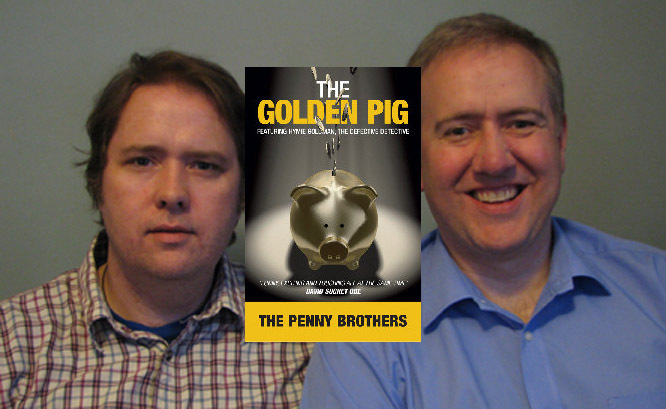 So do read “The Golden Pig” – it’s more fun than reading about how the authors wrote it, that’s for sure.